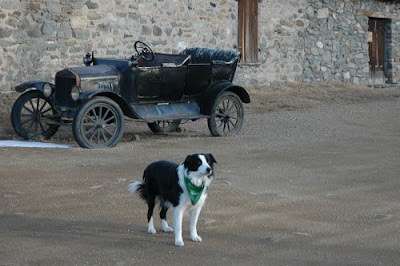 I paid a visit to Forsyth about a year ago, and the people there were talking to me about "old-timers" who came into the country in the late nineties, or even as late as 1910. When our outfit got up there in the fall of '83, Forsyth had a store, two saloons, a barber shop, a livery stable, and a hotel that was closed up -- the buffalo hunters having quit. The only women in the town were the storekeeper's wife, and a fat old haybag who had been scalped by the Indians at the mouth of the Musselshell a few years before, and was laying up with the barber. She had another one of those nicknames you can't repeat, much less print it. What there was of the town was strung out along one side of the railroad track the way it is today, only they have a nice park there now. The Northern Pacific was completed through Montana that year, and President Arthur took a trip over the line to celebrate it. I remember when I went to Forsyth to shoe a horse that fall, somebody said, "The President's coming through here on the train." So I waited to see it, and it came through all decorated with flags. I've mentioned before that I'm a big fan of old signs ... they're very intriguing visually, and they have the ability to evoke an earlier time in a way that few other things can. Here's a shot of another one that I've always liked. 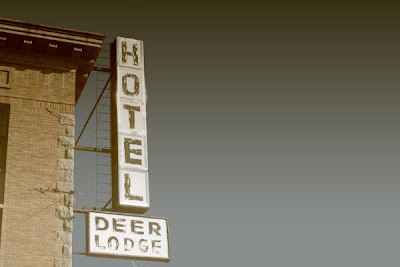 The Hotel Deer Lodge was a classic downtown hostelry in its namesake city, a hub of activity there for the better part of a century. By the time I got to know it in the 1980s, though, it was down on its luck ... by then, it was a faded, mostly residential property, and most of the travelers stayed at the Super 8 out by the freeway. The hotel closed not long after that, and it's been sitting there empty ever since. Up till the end, though, it was still the local Greyhound bus terminal, and I remember another big old sign in the lobby, next to what once might have been a transportation desk. All the bus schedules were listed there, but there were train schedules, too ... even though no passenger trains stopped in Deer Lodge anymore. A couple of the trains on the sign, in fact, had been gone since the 1950s. For some reason, I really liked that. Just a quick, random photo for today ... 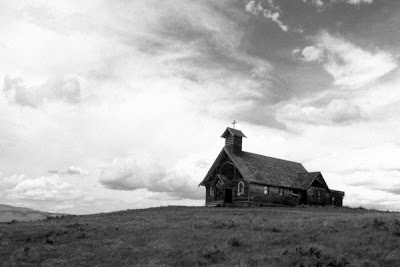 I took this shot a couple of years ago at the old Lone Tree Bench school, out in far southern Blaine county. It's a little one-room building, and it closed (probably for good) a few years ago ... perhaps the most remote little schoolhouse in a state that's known for remote little schoolhouses. And yep, this is a self-portrait. 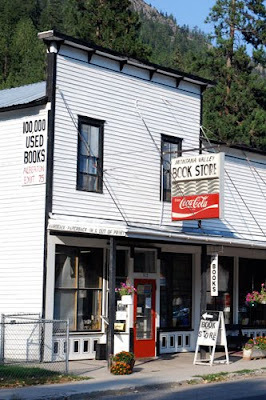 Nowadays, the mention of a novel about a western cattle drive usually refers to Lonesome Dove, but a century ago the book to read was The Log of a Cowboy, by a Colorado author named Andy Adams. Published in 1903, the book recalls a cattle drive from Texas to northern Montana ... it's fiction, but loosely based on some of Adams' own experiences. 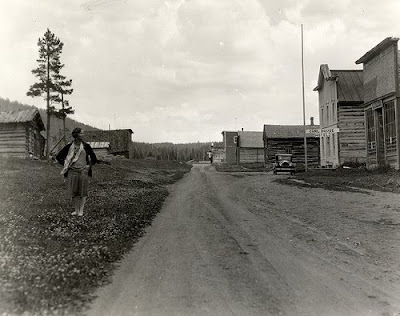 We had left word with Honeyman what horses we wanted to ride that afternoon, and lost little time in changing mounts; then we all set out to pay our respects to the mushroom village on the Yellowstone. Most of us had money; and those of the outfit who had returned were clean shaven and brought the report that a shave was two-bits and a drink the same price. 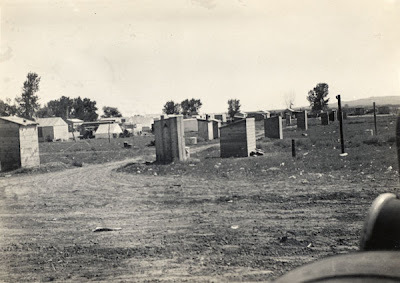 The town struck me as something new and novel, two thirds of the habitations being of canvas. Immense quantities of buffalo hides were drying or already baled, and waiting transportation as we afterward learned to navigable points on the Missouri. 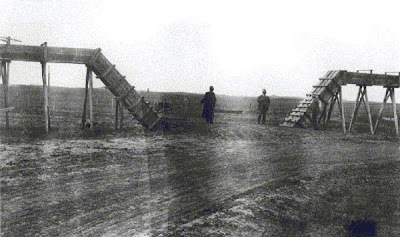 Large bull trains were encamped on the outskirts of the village, while many such outfits were in town, receiving cargoes or discharging freight. The drivers of these ox trains lounged in the streets and thronged the saloons and gambling resorts. The population was extremely mixed, and almost every language could be heard spoken on the streets. The men were fine types of the pioneer, -- buffalo hunters, freighters, and other plainsmen, though hardly as picturesque in figure and costume as a modern artist would paint them. For native coloring, there were typical specimens of northern Indians, grunting their jargon amid the babel of other tongues; and groups of squaws wandered through the irregular streets in gaudy blankets and red calico. The only civilizing element to be seen was the camp of engineers, running the survey of the Northern Pacific railroad. Tying our horses in a group to a hitch-rack in the rear of a saloon called The Buffalo Bull, we entered by a rear door and lined up at the bar for our first drink since leaving Ogalalla. Games of chance were running in the rear for those who felt inclined to try their luck, while in front of the bar, against the farther wall, were a number of small tables, around which were seated the patrons of the place, playing for the drinks. One couldn't help being impressed with the unrestrained freedom of the village, whose sole product seemed to be buffalo hides. Every man in the place wore the regulation six-shooter in his belt, and quite a number wore two. The primitive law of nature known as self-preservation, was very evident in August of '82 at Frenchman's Ford. It reminded me of the early days at home in Texas, where, on arising in the morning, one buckled on his six-shooter as though it were part of his dress. If my father did indeed feel alien in these physical surroundings, it wasn't for long. 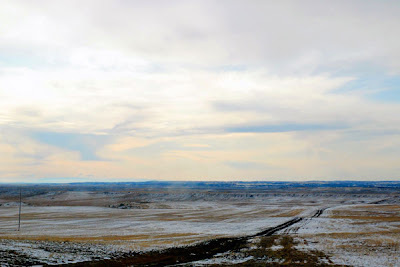 He used to tell me abut his first morning in Choteau. He had arisen early and gone outside. The air he inhaled cheered him as no air had before. Five miles southward rose two lonely buttes, which in that atmosphere he estimated to be about a mile away. 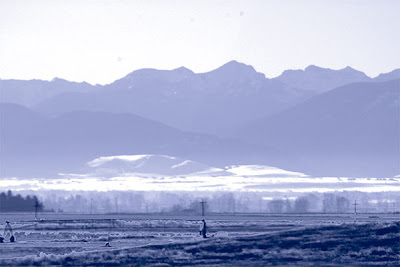 All up and down the western skyline stood the great blue lift of the Rocky Mountains. 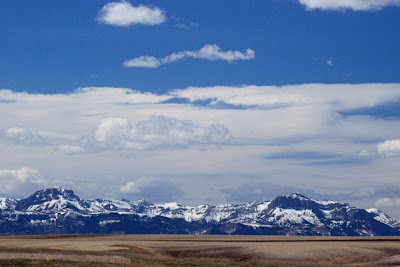 Benches climbed from he valley of the Teton River and to the east leveled into flatlands that ran out of sight. Overhead -- you could almost say on all sides, too -- was the sky -- deeper, bluer, bigger than he had ever known. The breathed the air. He looked. He heard the ring of silence. He felt somehow afloat in space. A shudder shook him, the shudder of delight. He stretched his arms wide and said aloud, "By George, I'm free!" 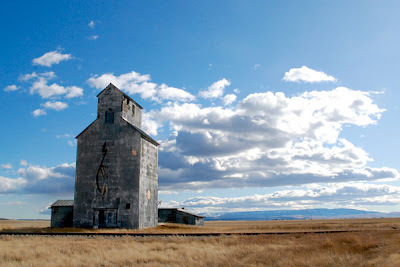 There's no doubt at all that the grain elevator is the manmade feature most associated with Montana's agricultural landscape. They're extraordinarily evocative things, standing tall and brave and often alone against a mostly-horizontal horizon. 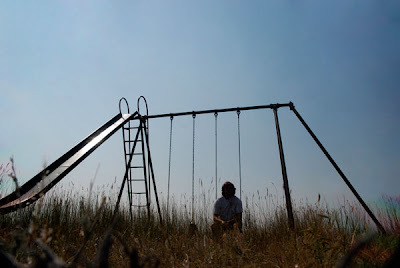 Mostly, the elevators were tied to the railroads and the small towns that grew up along their lines ... and as the towns faded away, sometimes the elevator was all that was left. 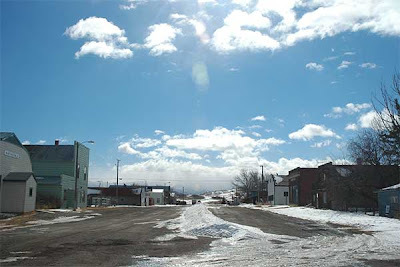 This is a photo I took last fall of the elevator in Ross Fork, a town that -- like many -- probably never amounted to much. The post office there closed 40 years ago, and today it's basically just a farmyard, with the old railway depot turned into a storage shed. But the elevator is still there, easily the grandest site for a good long ways. Sometimes an old photograph is interesting for its subject matter ... and other times an image is appealing for its beauty. The best ones, of course, have both those traits, and I think today's photo is one of those. 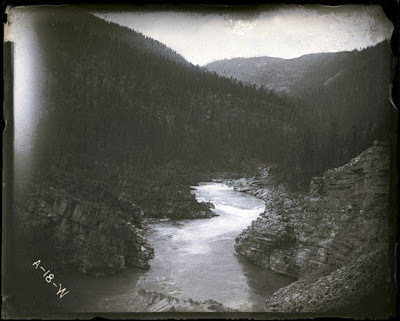 This is a shot taken roughly a century ago, almost certainly somewhere in Glacier National Park. 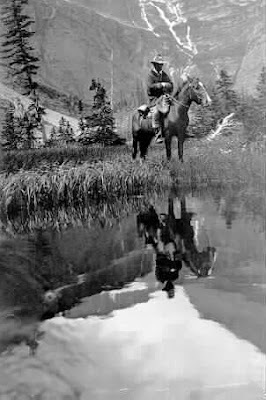 The composition is interesting, with its emphasis on the reflection in the water, but the shot becomes more intriguing when you learn the identity of the man on horseback. That's Louis HIll, one of the sons of James J. Hill, the builder of the Great Northern Railway. Louis Hill succeeded his father as president of the Great Northern, but here in Montana he was known primarily as an advocate for Glacier National Park -- both for its establishment, and for the network of railway-built hotels and chalets that existed there. As much as anyone, this is the man responsible for Glacier's status as the state's best-known tourist attraction. One of the best-known of those songs is "Meet Me in Montana," a duet recorded in 1985 by Dan Seals and Marie Osmond. The song hit #1 on the country charts, and was a much-needed boost for both performers' careers. 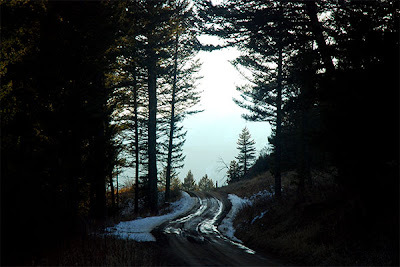 Like much of the popular music about the state, it played up the idea of Montana as a refuge, a beautiful setting to enjoy a straightforward and honest life ... a place to escape the stress and broken dreams of the big city. 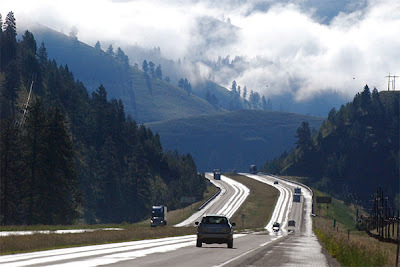 I remember hearing to "Meet Me in Montana" on the radio quite a bit back in the 80s, and having mixed emotions -- happy that a song about my state had made it big, while simultaneously cringing at how awful I thought the music was. But maybe that was just me. Today's photo is a frame from from one of the more notorious bits of twentieth-century Montana film ... at least in the eyes of some people. 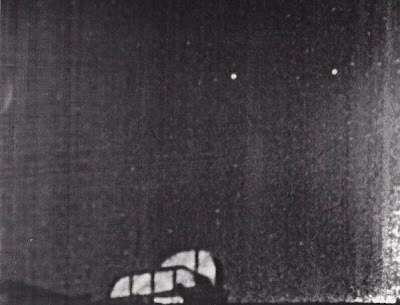 It's part of a few seconds of 16mm motion-picture film shot on August 15, 1950 by a man named Nicolas Mariana, who at the time was general manager of the Great Falls "Selectrics," a minor-league baseball franchise. Out at the ball field that morning, Mariana looked up into the sky and saw ... flying saucers! Two of them, supposedly, flying around like crazy. Here's one of the exposures from the film. The metal thing at the bottom of the image is ventilation equipment atop a nearby roof, and the two bright white dots are -- well, who knows? 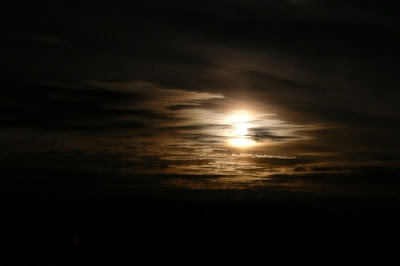 Just a quick, random shot this morning ... a photo of gorgeous moon I saw about five years ago while driving out near Milligan Canyon. As usual, I didn't have my tripod with me, and so I just sat my camera on the roof of the car and hoped for the best. Many American travelers in the first part of the Twentieth Century were familiar with the advertising phrase, "See America First." The point behind the slogan was that America's scenic wonders were every bit the equal of those in Europe or elsewhere ... so it made sense to vacation in the U.S.
Credit for inventing the phrase goes to a man named Fred Kiser, who's best remembered for his early photographs of Crater Lake National Park in Oregon. "See America First," though, dates from Kiser's earlier photography work for the Great Northern Railway, in particular the images he captured of northwestern Montana. 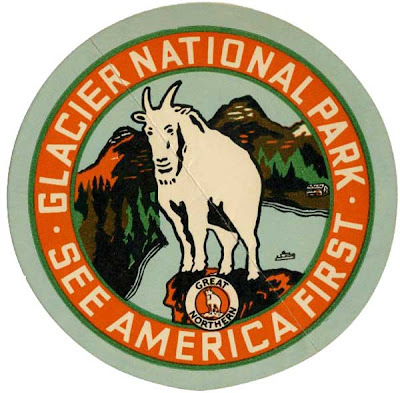 The Great Northern began using "See America First" as an advertising slogan in 1906, and the phrase spread. 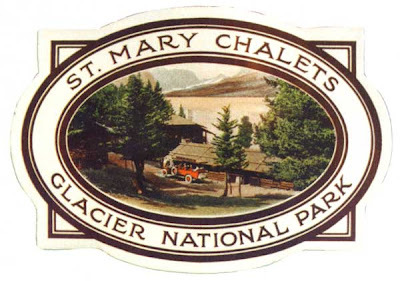 Kiser's photos were used in the railroad's lobbying campaign for the creation of Glacier Park, and his catchphrase was tied to the park for decades thereafter. Today's image is a luggage sticker from the 1920s or so, created by the railroad as a promotional item for its travelers. Well, Montana's in the middle of another week of frigid weather. Not an awful lot of snow -- just a few inches of powder here -- but the temps last night were down to 20 below or worse. I hate being out in it, but I have to admit that it can be rally lovely. When it gets like this, the sun seems unusually bright, the sky especially clear and sharp, the colors especially evocative ... an icy, pale-blue tint to everything. Yesterday's mention of the Nixon photo collection made me think of another image that Nixon took, one of the most incongruous of the collection ... so I thought I'd post it here before moving on. Back in 1971, America's passenger rail network was dying. Amtrak had just been created, an event that saw the discontinuance of most of Montana's passenger trains, and many thought that the rest of the trains would soon disappear, as well. The country had just a handful of modern trains back then, operating in the east, and in an effort to generate enthusiasm Amtrak sent one of those on a cross-country tour. 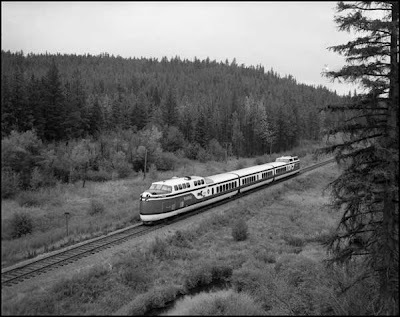 This is the "turbotrain" -- it passed through southern Montana in late August 1971, and apparently garnered all sorts of attention. This is a photo Nixon took of the train passing over Evaro Hill. Of course, passenger trains in America didn't end up (quite) dying ... but the turbotrain didn't up being the future of American travel, either. Nowadays, there are people lobbying for restoration of passenger trains across southern Montana. I doubt that it will happen for a while, and if it does I doubt that our train will look this cool ... but we could do a lot worse. There's nothing more evocative than browsing through a stack of historic photographs ... and nowadays a number of museums and archives are making their photo collections available on the Internet, which is a truly wonderful thing. 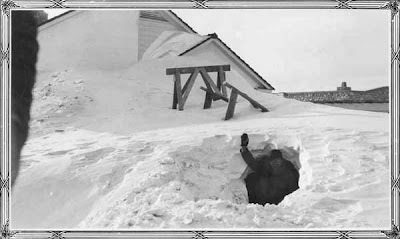 There are a number of online repositories of Montana-related images, and while a couple of them are really badly done (I'm looking at you, Livingston), most of them are great, good for hours of nostalgic browsing. One of my favorite such sites is maintained by the Museum of the Rockies, which holds the photo collection of the late Ron Nixon, one of the state's greatest railroad photographers. There are over 20,000 images in the Nixon collection, and the Museum has put nearly 12,000 of them online ... mostly from Montana, and mostly quite intriguing. 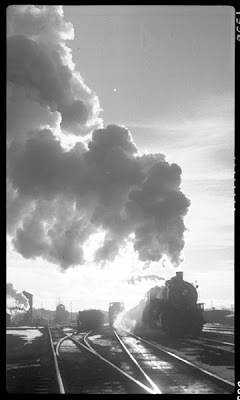 Here's a photo from the Nixon collection that's one of my favorites -- it's a shot of a Northern Pacific coal train heading out of Forsyth on February 20, 1939.